Capt. Stan's Deep Sea Chronicles: American Pharoah Wins The Belmont Stakes! Following repeated victory across the 2015 horseracing season – at the Kentucky Derby, Rebel Stakes, Arkansas Derby, and Preakness Stakes – American Pharoah kept the momentum going and prevailed in the prestigious Belmont Stakes, winning the coveted Triple Crown after leading the race from start to finish as 2:26.65. The victory by 5 ½ lengths is the sixth-fastest in the race's history and second-fastest time for a Triple Crown. 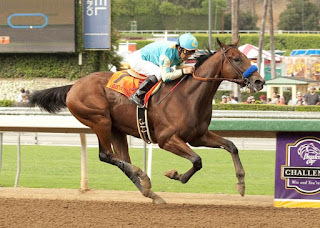 American Pharoah also made history as the American winner of the prize since Affirmed in 1978. To top it all off, the thoroughbred’s 128 rating eared it the top position in the Longines World’s Best Racehorse Rankings for 2015. In the wider world of horseracing, American Pharoah was not the horse enjoying glory! Golden Horn put in an impressive showing to win the Investec Epsom Derby by 3 1/2 lengths, joining Able Friend and Shared Belief as the joint second-highest rated horses in the world. In France meanwhile, Treve won her seasonal debut,taking the Prix Corrida by four lengths. Now, the joint highest-rated horse in the world in 2013 is set to secure an unprecedented third victory in the Qatar Prix de l'Arc de Triomphe this October. As an avid horseracing fan, Captain Stan of The THERAPY-IV Miami Beach Deep Sea Fishing Charter Boat is excited by the news. While you are here, pay a visit to our website to learn more about our Miami Beach Deep Sea Fishing services, or contact 305-945-1578 or info@therapy4.com.